The Dog Days of Summer Pet Basket Promotion is bring in lots of pets to draw. I always admire the way people loves their pets. Pet owners are very special and loving. They have a positive energy that is fun to be around, so I am having a great time with this promotion. August. I know I will be really busy then. I have found that we may need to revise the baskets. One dog that I am drawing does not wear anything including a scarf. :o) So if your pet does not like to dress up or if you prefer you can get a place mat for his bowl to set on instead of the scarf. Your pet’s name will be embroidered on the place mat. If your pet is a snake then I will have to really think about that. I think a snake might need more than one substitution to the basket but I will figure that out when the time comes. Last weekend was a lot of fun. I got some drawing done and followed up on some leads of drawings to do. 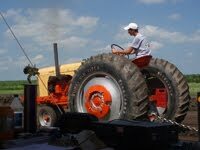 I am working on another national tractor show proposal for 2011. My art has been auctioned off at several banquets and always brings a good price, which is a big plus to organizations wanting to make money. The National Massey Assoc. drawing is finished. It is matted and framed in a 16”x20” oak frame. It will be at the National Expo in Pinkneyville, IL Aug. 18 - 22, 2010. It will be auctioned off at the Expo. Hope you get to go and enjoy the fun. Things have been really busy around TerpCreek.com. 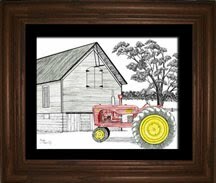 I am almost finished with the Massey 44 pen and ink drawing for the National Massey Expo. It should be done next week, hopefully. 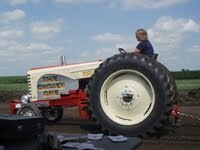 We were at Kirkwood’s Celebration for the Bald Bluff Antique Tractor Pull last weekend. I took lots of photos and posted them on TerpCreek.com. One class paid out $500 for first. The winner of this class is pictured on the Case. We met some wonderful people that came 150 miles to pull. Their tractor, “The Chosen One” is really classey. The Kirkwood show had some wonderful fireworks. It is always a good show with good food and fun. I am currently working on The Dog Days of Summer Pet Basket Promotion. 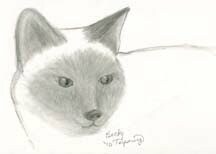 This is a real fun project and I have met some really cute pets. More about that next time. Hope everyone has a safe 4th of July.